Wednesday 7th April 2010, 8:00 pm. Speaker: Professor Kristina Höök, Mobile Life centre, Stockholm. University of Edinburgh Informatics Forum, 10 Crichton Street, Edinburgh, EH8 9AB - map (click on Informatics Forum in the list of buildings). Tickets are required for this event. They may be purchased directly fron the Edinburgh International Science Festival. Involving our corporeal bodies in interaction can create strong affective experiences – we enjoy getting physical! But to create engaging technologies we need qualities like suppleness, game play, embodiment, reflection, affective loops and pliability. Kristina will discuss the challenges in recent projects, including eMoto (mobile emotional messaging using gesture), Affective Diary (a way to remember your bodily and social experiences), and Affective Health (a mobile service empowering users to deal with stress). Kristina Höök leads the Mobile Life Centre, Stockholm. 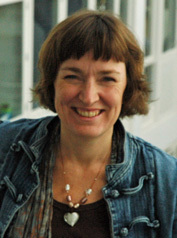 She is a professor in Computer and Systems Science, Stockholm University/KTH Royal Institute of Technology and also works for the Swedish Institute of Computer Science (SICS). Kristina’s group focus on social, emotional and bodily interaction in mobile settings, taking a user-centred design perspective. They have pioneered the concept of the “Affective Loop”, taking users step-by-step through a software application, capturing how users are influenced, imitate and become involved, both physically and cognitively. Höök is also known for her work on social navigation – how previous users’ choices influence our navigation information and interaction spaces, editing (with David Benyon and Alan Munro) an influential book in 1999. She has published more than 50 papers in leading international journals and conferences and has been invited to give keynote addresses at prestigious international conferences (NordCHI’04, Mensch & Computer 2003, ECTEL-08, CHI’04, The Royal Society in London, INTERACT2009. She was awarded the Cor Bayeen fellowship for her PhD-thesis in 1996. In 2005 she was granted an INGVAR II award. The INGVAR grant is handed out for the advancement of young, future research leaders in Sweden by the Strategic Research Foundation. In 2007, Kristina Höök, Lars Erik Holmquist, Oskar Juhlin and Annika Waern, were granted a VINNex center named “Mobile Life” with funding for 10 years from VINNOVA and several industrial (Ericsson, TeliaSonera, Microsoft, Nokia, Sony Ericsson) and public sector partners (Stockholm City Municipality, Kista Science City and STING).